The TB26 is a new model with machine output +20% and the banding width enlarged. 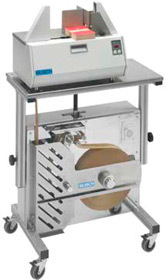 For high volume production a large reel stand offers longer intervals between reel changes – kraft paper tape length is 800m – compared with 150m on the internal reel. The large reel stand can also be wheeled to wherever it is needed, then the wheels are locked for safety. The stand can be retro-fitted to a current model banding machine at any time.